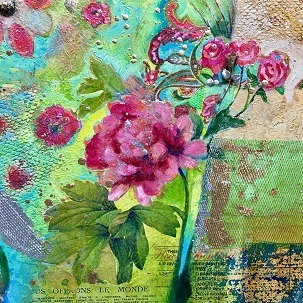 Learn how to combine acrylic and collage to create a beautiful work of art that expresses your personality! Designed for any level, whether beginners or more experienced artists, this workshop will give you an overview of the versatility of acrylic painting. It’s a great way to get started in acrylics if you have never painted before, or for those already using acrylics, this will add some new techniques and skills to your "tool box." Tracy will “meet you where you are” to teach you lots of fun techniques to inspire and unleash your unique creativity – things you can use on future projects, too! So many artists are intrigued by the world of acrylics, but what makes them so versatile and wonderful are the gels and pastes you mix with the pigments to change the consistency and build texture. This class is all about learning the techniques that appeal to you, so you can express yourself, play and enjoy the process of what all these mysterious jars of "goo" can do! Over the course of two days, Tracy will take you step by step, demo-ing each technique along the way, so you can see how to handle both the acrylics and the tools. With Tracy’s encouragement and support, you will use simple shapes from flowers to faces and more, and you will add as much or as little collage material as you prefer: paintings can be very intriguing by laying papers, photos, bits of jewelry, to make the flowers in the vase, or in the portrait’s hair. (See the supply list for more info.) This workshop also includes a field trip to ARTspot for a fun and informative shopping trip, where you can take advantage of your student discount there, with Tracy there to help point out cool products and answer any questions. Not only will Tracy be demo-ing these great techniques, she will also help you develop the mindset to trust yourself, let go, and express your own creativity. Our goal is for you to spend two days enjoying the safety net of working with a supportive and experienced instructor. This is a super upbeat and supportive workshop experience in a class that encourages an experimental contemporary approach and how to combine materials to create your own personal style. A variety of Acrylic Heavy Body Paints (the kind in tubes). 1. If you are starting from scratch, Tracy’s best recommendation is: Golden Modern Color Theory Set of 8 colors as a perfect set to start with. (This set is required for Tracy’s Color Theory scheduled later in the year and you’ll already have the right colors for that class.) It is not required for this class. 2. Get a few basic colors of good quality. This class could be great with a limited range of colors. 3. Consider adding in a metallic paint: silver, gold, pearl and copper are all fun. A little goes a long way. Tracy has a great list of paint colors that she likes to have on her palette. Click here if you’d like to see her list. Note: These are not required for this workshop – it’s for your information only. Required: One 1 oz Fluid acrylic paint: Choose any quinacridone color or any other transparent color to give your painting a final glaze. Choose a color that you like as it will be giving your finished painting its final “glow”. Brushes: A variety of brushes. Bring what you already have. Palette: Tracy uses the Mijello Acrylic Palette with a snap tight lid. It reliably saves paint to reuse again! Student choice: you can get by with a disposable paper palette, a Tupperware with a flat bottom, or waxed paper plate. · Collage papers and ephemera: Tracy supplies these items to share, but if you have something you would like to use of your own, you are encouraged to bring! Memorabilia can really personalize your art. Jewelry findings, or odd bits and bobs. · If you already have these items and want instruction on how to use them, you are welcome to bring: Pearl Ex, Alcohol Inks, High Flow Acrylics, silicon wedges, etc.